Scones, in their traditional form, are pretty much devoid of nutrients and are high in carbs, making them a less than desirable breakfast option. They are, however, undeniably delicious and go quite nicely with your morning coffee or tea. 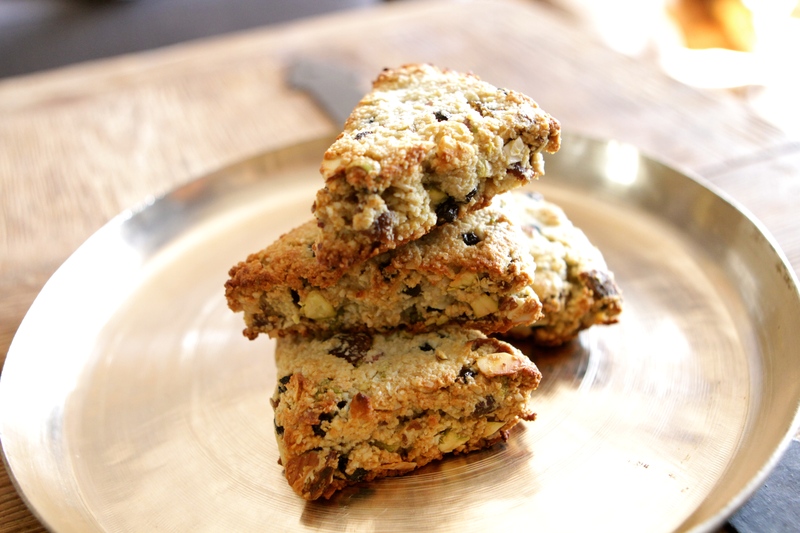 These almond flour scones make for a much more nutritionally dense option that is higher in protein as well as heart-disease fighting plant sterols and Vitamin E. You can choose any dried fruit and nut combination you like. Enjoy these with a pat of grass fed butter! Preheat the oven to 350 degrees and line a baking sheet with parchment paper. In a large bowl, combine almond flour, baking soda and sea salt. Mix in the dried fruit and nuts. In a separate bowl, whisk together the egg and honey, then add the wet ingredients to the dry. The mixture will seem too dry at first, but just keep stirring until the dough comes together. Form dough into a ball, then shape into a square, about 1/2 inch thick. Cut into 10 triangles. Bake 10-12 minutes until golden brown.